All I needed to make the sounds for composing this music were the two pieces of common Cork City Street Litter which I rescued recently to become musical instruments, a few pebbles, and a Superball mallet. 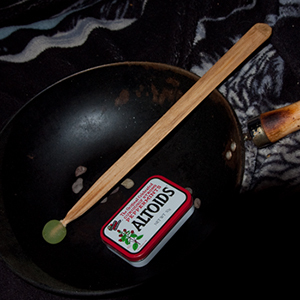 The Altoids Tin supplies the “Timpani” rolls – everything else is played on the Wok. There is currently (Janury 28th/29th 2o12) a series of events on in Cork City to celebrate the work of John Cage. 2012 is the John Cage Centenary Year. I disagree strongly with some of his ideas, especially about the role of the performer and the composer. However, I respect him and his work highly and I regard him as one of the greatest composers of the 20th century, a true revolutionary. I have been privileged to be asked to perform his music while I was still at college. To determine the spacing and pacing of the beats on the wok, I used a random procedure, removing my own preferences and prejudices from the process of composing the music. This is something which Cage proposes and with which I disagree as a general approach to composing pieces of music. I work a lot with abstract atonal and arythmic textures, though, and here I often find that my own preferences get in the way and impose limits on what I can do. Removing them in such cases sometimes seems to result in more exciting and “organic” sounding music, sometimes with an element of suspense which would take me a long time and much trial and error to create with deliberation. Another piece of music I composed recently for this combination of instruments is Scythian Chit-Chat. This entry was posted in Articles With Music For Downloading, My Sticky Opinions. Bookmark the permalink.